Most of the $2.88 trillion the government collected came from individual income taxes, which comprised nearly half of that total, totaling $1.3 trillion. The Treasury Department has been tracking these data on its website since 1998. In that fiscal year, the federal government collected about $2.3 trillion in inflation-adjusted revenue in the first 11 months. This means that since 1998, tax revenues have increased about 25 percent. Although the federal government brought in a record of approximately $2.88 trillion in revenue in the first 11 months of fiscal 2015, according to the Treasury, it also spent approximately $3.4 trillion, leaving a deficit of approximately $529 billion. 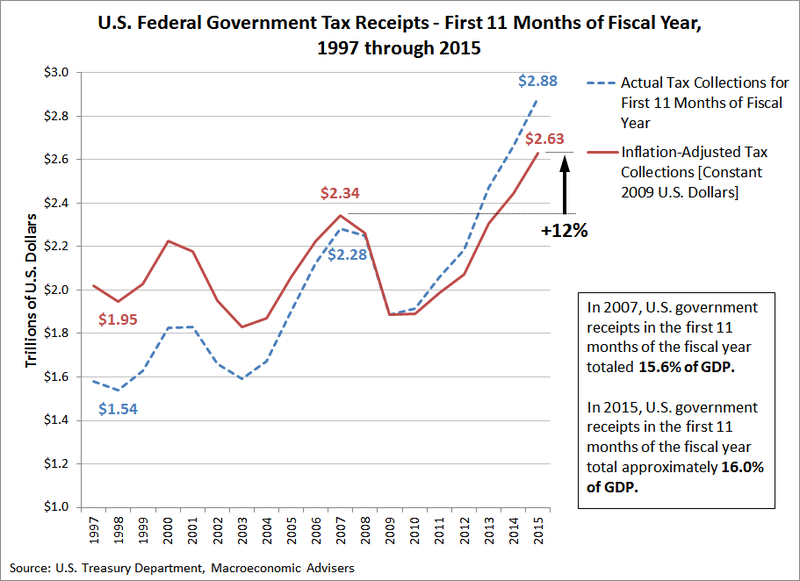 The chart below shows how the federal government’s tax collections have fared since 1997, both with and without the effect of inflation (as measured by the GDP deflator), which we estimated using Macroeconomic Advisers’ monthly GDP data recorded in the eleventh month of each federal fiscal year from 1997 through 2014, with a projection for 2015, based on the most recently reported month of June 2015. Doing some quick, back-of-the-envelope math, we see that in 2007, when tax receipts last peaked at $2.34 trillion (in 2009 U.S. dollars), the federal government collected 15.6% of the entire GDP of the U.S. economy recorded at that time. Eight years later, at $2.63 trillion (in 2009 U.S. dollars), we find that this figure would represent approximately 16.0% of the value of the entire GDP of the U.S. economy through today, as the U.S. government has increased its tax collections by 12.3%, a $289 billion increase in terms of constant 2009 U.S. dollars. Over the same time, the U.S. economy itself grew by just 9.6%. In 2007, with a budget deficit of $160.7 billion, such increased revenues would have been more than enough to both eliminate the deficit and provide the nation with a $128 billion surplus. Instead, at $529 billion, the federal government’s budget deficit in 2015 is nearly 3.3 times as large as what it was in 2007. 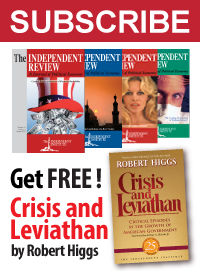 We confirm then that a lack of spending restraint, rather than a lack of increased taxation, is responsible for the U.S. government’s present fiscal mess, as its expenditure of money has grown far faster than the people can sustain. Consequently, the nation is once again is nearing the possibility of another federal government shut down. And yet, President Obama would appear to be determined to remove the only constraint on the U.S. government’s spending that he both proposed and signed into law. Like most politicians, the president is not one for any kind of effective spending restraint, and certainly not when he perceives that he might gain politically by putting the nation through another artificial fiscal crisis. Even though that crisis will arise not because he has restrained his spending by too much, but because he has not restrained it enough. The malady of self-delusion can be quite a spectacle.